Looking for the best wet food for your dog? Some pet parents choose to only feed wet food (which comes in either a can or a pouch) while others may choose to mix it with dry dog food to entice picky eaters. Keeping your dog healthy means feeding her a highly nutritious diet, so only the best formulas will do. According to several dog food reviews websites, these are six of the best wet dog foods to feed your dog. The dog foods on this list have passed testing standards put forth by the American Association of Feed Control Officials (AAFCO) as being “complete and balanced” to provide all the nutrition your dog needs. 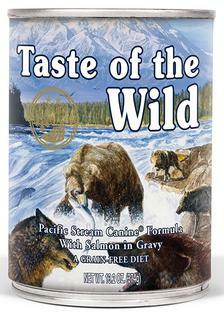 Designed to mimic your dog’s ancestral diet, Taste of the Wild canned dog foods always use real meat as the first ingredient. There are five different formulas, all of which are grain free and gluten free. These foods are complete and balanced, meaning they can be fed as your dog’s sole diet. The company makes both dry and wet dog food as well as a variety of treats, all of which are highly rated. Their canned line includes five formulas that are all grain free and without artificial colors, flavors, or preservatives. They are packed with real meat and healthy vegetables to meet your dog’s nutritional needs. 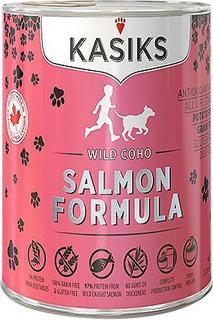 There are four different formulas in the Kasiks line of wet dog food, including a unique “grub” recipe that uses insect protein. This family-owned company operates out of British Columbia, Canada and makes dog foods that are grain, gluten, and potato free. You’ll find six different flavors of Wellness Core Grain Free canned dog foods. These foods were developed based on the philosophy that dogs thrive on a diet mainly comprised of meat. Each one is complete and balanced and can be served as a standalone meal or mixed with dry food. Merrick uses locally sourced ingredients for their dog foods that are cooked in their USA kitchen. They have a massive selection of grain-free canned dog foods, including seasonal holiday recipes, puppy-specific formulas, and a variety of texture and flavor options. 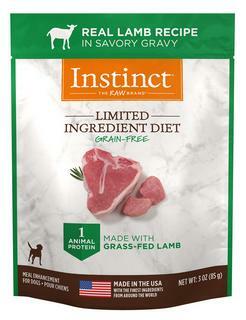 Nature’s Variety Instinct dog foods are made with the belief that nutrition should be whole, pure, and as close as possible to its natural state. All wet dog foods are grain free and come in pouches, cans, or cups made for small breeds. You’ll find a variety of formula options, including limited ingredient diets for dogs with sensitive digestive systems.